Wood connoisseurs who see my work for the first time always ask, were do I get my wood? The truth is that I'm blessed with some very good friends and others who appreciate what I can sometimes make of what might otherwise become firewood and who also know of my appreciation for things unusual and other oddities of Mother Nature in tree form. Some old friends of mine living in Ohio needed to remove a tree due to old age and decay. A day of hard work in removing this tree resulted in a small pick-up truckload of selected Red Maple, and the best of the lot was selected for this bowl. 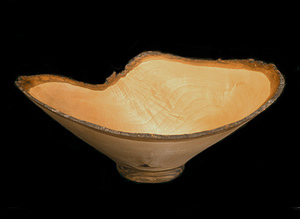 This bowl started out as a bulbous outgrowth on the trunk before preparing it for turning. Without know exactly was was on the inside, this piece just cried out, at least - intuitively - to me, that it should be turned from the outside: inwards towards the middle of the trunk. The revealing of the very unusual wave-like grain patterns was due to the nature of the outgrowth and the particular direction in which the piece was turned. The inclusion of some very nice "flame" - the pattern that runs perpendicular to the grain - and the fact that the entire edge of the natural bark was very carefully maintained (a technically difficult task in turning thin-walled natural-edge bowls) - like icing on the cake - make this a very striking and handsome piece.